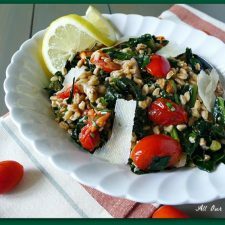 I know it must seem that we use kale a lot but our Warm Tuscan Farro Salad wouldn’t be the same without kale. Spinach has a tendency to wilt a bit as well as arugula. So, when we’re making a dish that is warm and includes a green leafy vegetable — we want that vegetable to hold up. I suppose it would be like me being in the South — middle of summer — no A/C. I wouldn’t just wilt, I would be a puddle on the floor. That’s the way baby spinach or arugula would be in this dish. There are fruits and vegetables, as well as people, who thrive in the heat and humidity — I’m NOT one of them. Nope! I’m a wimp. A whining Italian is NOT a pretty sight, and believe me, the audio is even worse!! 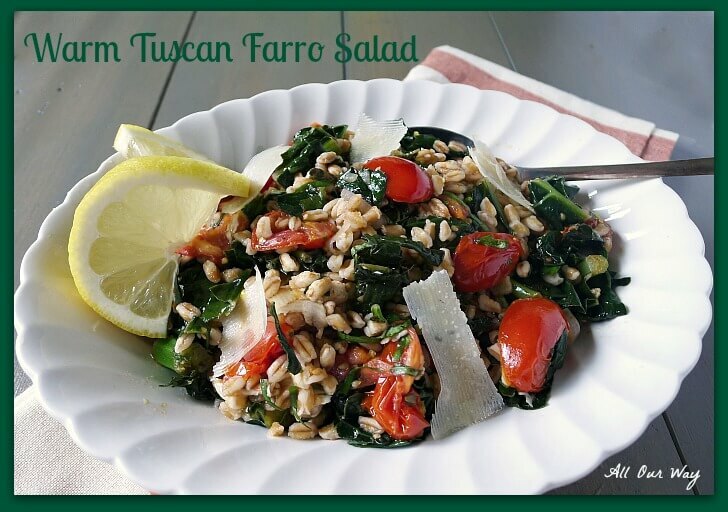 Our Warm Tuscan Farro Salad was supposed to be posted two weeks ago but then electronics got in the way. You know how bad things are supposed to go in threes? Well, I think we passed it. Now, I can’t say anything was earth shattering — just inconvenient. . . things that had to be taken care of. This Warm Tuscan Farro Salad is delicious served warm but it is also good cold. We had some left over and we thought it tasted wonderful. We like using farro — its dense, nutty, chewy texture stands up well to whatever dressing or sauce we put on it. Along with tasting great it is high in fiber and much more healthful than white rice. Farro is an ancient grain that now has enjoyed a comeback. At first it was a little difficult to find but it is fairly easy to find in the grocery stores. Farro is now a staple in our pantry. 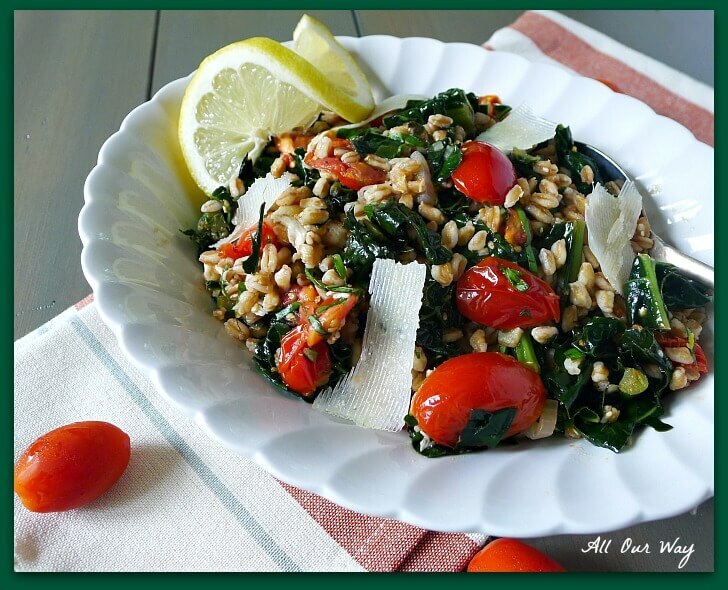 Tuscan farro salad with kale, grape tomatoes and pecorino cheese can be served warm or cold. The dressing is a fresh tasting basil-lemon vinaigrette. 2 cups semi-pearled dry farro rinsed (12 oz.) This is to prevent farro grains from sticking, rinse away excess starch under cool water before cooking. 1/2 cup shaved pecorino 1.5 oz. For the farro: boil 3 1/4 cups water ad 1/2 teaspoon salt in a saucepan. Add the rinsed farro, reduce heat, and simmer, stirring occasionally, until tender, 15-20 minutes; remove from heat ad drain any excess water. Sauté shallots, garlic, and pepper flakes in 1 Tablespoon oil in a sauté pan over medium-heat, 1 minute. Stir in kale and 1/4 cup broth; cook until softened, 5 minutes. Add tomatoes, vinegar, and 1/2 teaspoon salt. Stir in farro, pecorino, and zest. For the vinaigrette, whisk together basil, 1/4 cup oil, and lemon juice; season with 1/2 teaspoon salt and freshly ground black pepper. Toss salad with vinaigrette to coat. ** We buy organic Tuscan kale from Trader Joe -- it's already cleaned and in torn pieces. Note: Recipes and content from @ All Our way is copyright protected. Please do not use content or recipe without prior written permission. If you want to share the information please link to this post. Grazie. Hi, Heather! Sometimes I feel like I’m making just farro recipes — we just like it so much. That salad looks mouth-watering! It’s simply gorgeous. Looks so fresh, healthy and delish! Thank you, Michele! It is a great recipe any time of year. It’s great on a picnic. This recipe looks amazing! I love all these ingredients! I’m all about kale so keep all the kale coming! What a perfect side dish for so many mains! Love the flavor in this dish! I have never tried farro before. Your recipe sounds so flavorful. Perfect for summer. Thank you so much for sharing this healthy salad. Absolutely! I don’t see why it wouldn’t work. The taste is great and it is so good for you!! Let me know how it turns out. A warm farro salad would be so good for today’s lunch. I’ve been craving something light for summer and this would be perfect! Hi, Kim! It is a great salad and it’s also great cold too if you have any left over. This salad looks like a complete meal,definitely perfect for dinner or lunch too.So many wonderful flavors. This would be a meal for me. I love having scrumptious salads like this, especially now that the weather is so hot and humid. This looks so light and refreshing. I love kale very much. Going to have to try this soon. Absolutely loving all of the fresh ingredients! And the texture of farro is one of my favorites. Great recipe idea! With the heat here in Houston, this would be great cold. Hi, Shanna! It is terrific cold. Stay cool and have a great 4th of July!! This looks fantastic. I especially love all those juicy, blistered tomatoes! Thank you, Jenni! They taste wonderful!! Wow what a great “full meal” salad. I love all the flavours happening here. This would be a great dinner any night of the week. Farro is under used…and that reminds me I need to make some soon. Love the texture and nutty flavour. Hello, Gloria! It is flavorful and nutritious!! This looks so refreshing and light. I love kale and am always looking for ways to eat them. 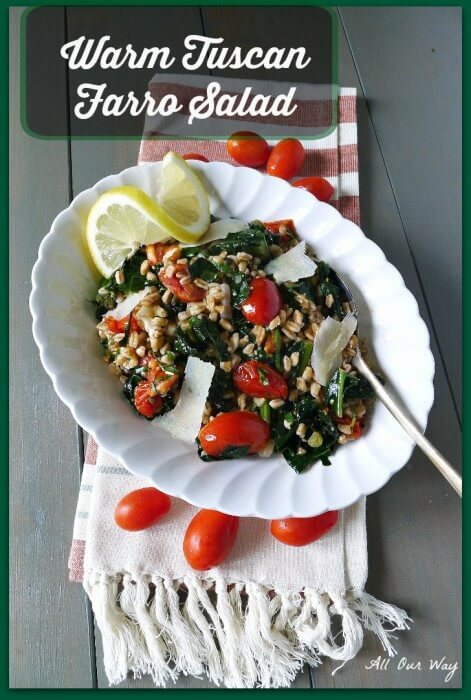 This farro salad would be a perfect dinner for me. I love such light meals for dinner. I like the idea of serving this salad cold for either a potluck or packing it up for my husband and me to take to work for lunch! The ingredients for vinaigrette are so fresh and light…perfect! Oh this looks so delicious! I was just watching Top Chef and someone made a warm Farro salad and I thought I have to try that (I’ve never had farro before). Wonderful post! I love farro! I had it for the first time last Winter when I found a recipe for Farro Stew. I love its heartiness and nutty flavor! Your salad looks and sounds delicious! Just the thought of shaved Parmesan and warm farro makes my mouth water . . . and then add all the other goodies – and it looks like you have a winner! I’ll need to print this and make it soon! Thanks for sharing, sweet Lady! Please send some of your wonderful sunshine to our state. I think it is gone!! Let me know how you like the salad. I’m making some of your refreshing drinks this week. Not a big fan of the heat here in Kentucky either, but I’d make sure the house was freezing if you’d come make one of those salads! Great job!!! I’m like you – I can’t take the heat either. I’d love this wonderful looking farro salad either hot or cold. I’ve got lots of kale in my garden and this will be one of the recipes I use it in. Thanks for the idea. How great that you’ve got kale in your garden — I imagine you’ve got some great tomato plants too. Lots of good recipes for kale — it’s a good thing because it’s a hearty plant.